A five-day strike on the Southern rail network has been announced by the RMT union in a long-running dispute over the role of guards. Members have staged several walkouts, with the next action set for 8 August. Parent firm Govia Thameslink (GTR) wants to use new trains where the driver operates the doors using CCTV, but the union fears job losses and has raised safety fears about the move. GTR said it was unacceptable passengers were being made to suffer. Chief operating officer Dyan Crowther said all onboard staff had a job with no reduction in salary. She said: "The sooner we can introduce the essential modernisation that our railways desperately need, the sooner we can stop the RMT from holding passengers to ransom. "Contrary to the RMT's accusation, we have always been open to talks and remain so." She claimed RMT General Secretary Mick Cash had been unwilling to enter into discussion. The union said changes to guards' roles were "due to be railroaded through" on 21 August and it had no option but to confirm the next strike. 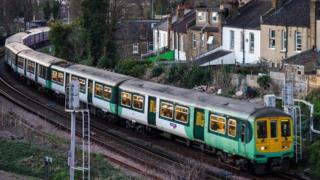 Mr Cash said the RMT had offered to suspend action for three months if Southern put its plans on hold. But he said the request had been "kicked back in our faces" and a letter sent by the union to new Transport Secretary Chris Grayling was ignored. He said: "This action has been forced on us by the arrogance and inaction of Govia Thameslink and the government who have made it clear that they have no interest in resolving this dispute or in tackling the daily chaos on Southern." He claimed neither the company nor government were prepared to engage and said: "They should wake up and get round the table now as an urgent priority." Rail minister Paul Maynard said the strike would do nothing other than cause yet more disruption and daily misery for passengers. He said: "It is deeply disappointing that the union bosses continue to overlook the impact they are having on the travelling public, and I strongly condemn this proposed action. "The changes GTR are proposing will modernise services and provide better journeys for passengers. "Clearly, the RMT has decided that it is not on the side of the passenger." A spokesman for the Rail Delivery Group called on union leaders to end the dispute. He said: "Drivers already open and close the doors on thousands of trains every day. "This way of working has been deemed safe by rail safety experts and the independent regulator which oversees safety on the railway. "It means other onboard staff who are trained in safety are free to help passengers more and to improve customer experience. No jobs or pay will be cut." This month, GTR brought in a reduced timetable to cope with ongoing disruption on Southern trains, axing 341 trains per day from the 2,242 weekday services it had provided. The operator blamed issues with crew availability for delays and cancellations of services. The RMT denied claims staff sickness amounted to unofficial industrial action. Commuters have protested in Sussex and London over the changed timetable and disruption across the network.